I was attending my conference July 4th through the 6th, but skipped out on the last day of the conference (July 7th) to go see CERN (the location of the large hadron collider). Debi, Toren, and Rosemary, meanwhile, had a number of adventures. They took the chocolate train through various parts of Switzerland, visiting the Gruyere cheese factory, the Gruyere castle, and the Maison Cailler chocolate factory. Amazingly, they took a picture in front of the Giger Museum, but didn’t know what it was and didn’t go in (I’ve got to go back just for that). 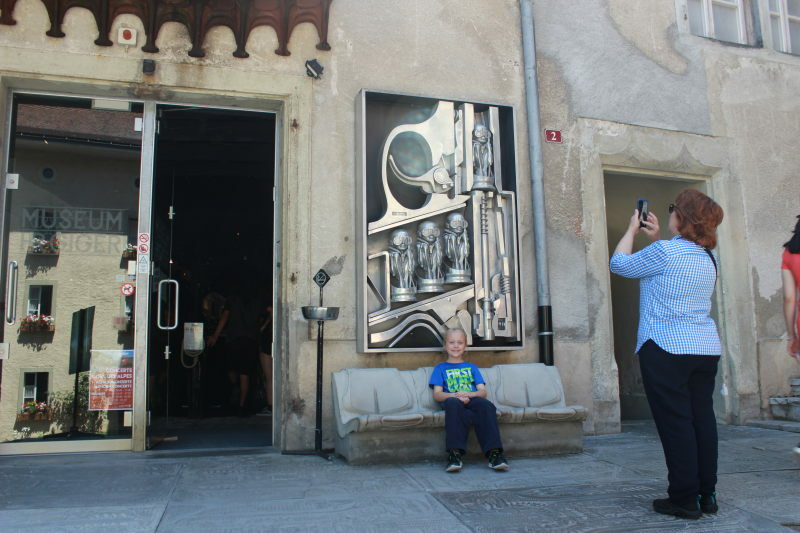 Toren in front of the Giger Museum. 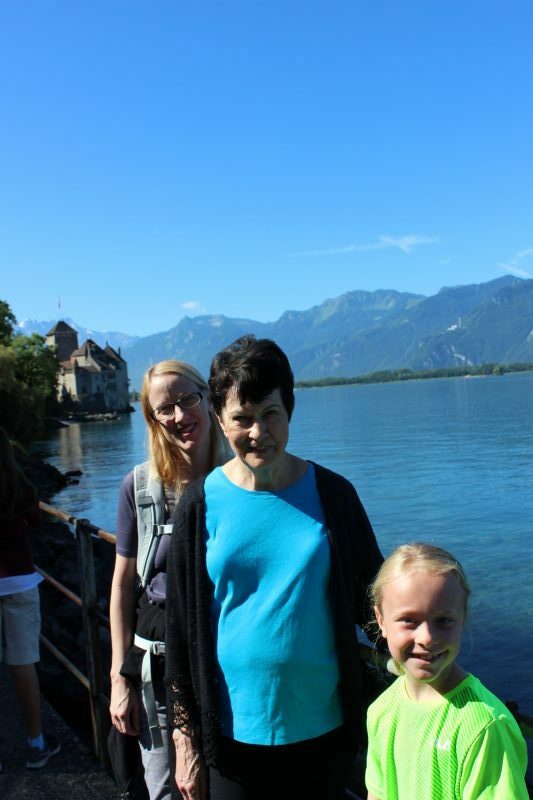 Debi, Rosemary, and Toren at Chillon Castle. I didn’t get to see the whole castle as I had to make it to my conference in time for the first session that day, but I got to see some of the castle. Again, I’ll have to go back. 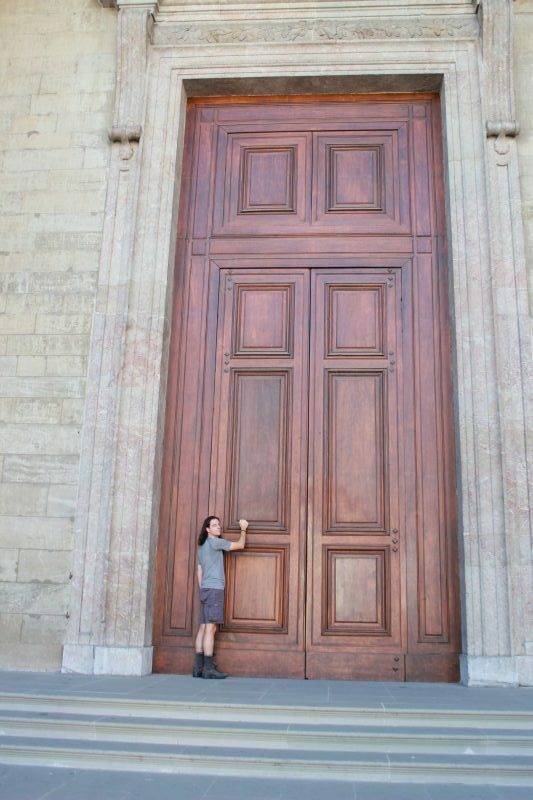 The one day I did skip of the conference was so we could go to CERN. Getting tickets was a bit of a nightmare as they have to be reserved in advance, go on sale at 8:00 am Swiss time, and are usually gone in a matter of minutes. Debi and I spent a few days getting up just before 2:00 am so we could get the tickets and eventually got 4 for the last day of my conference. 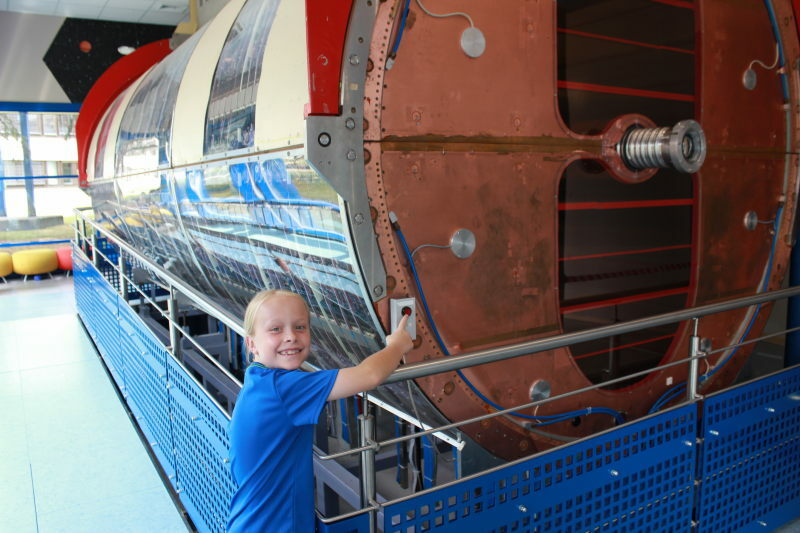 Toren pushing the “self-destruct” button on an old collider. It was a red button with no label, so I told him it was the self-destruct button and he immediately proceeded to push it. 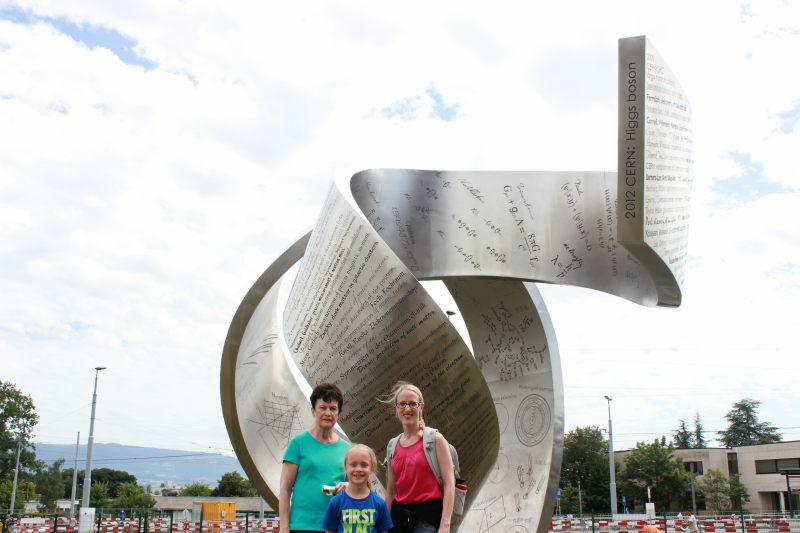 Rosemary, Toren, and Debi by a monument at CERN. 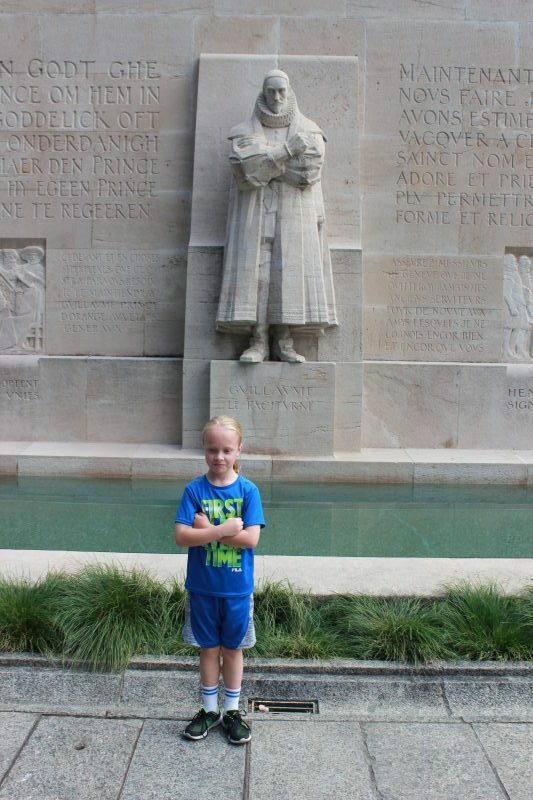 Toren posing as figures in the Reformation Wall. Before heading back for our last night in Switzerland, we stopped for a brief walk around downtown Geneva and got to see the Jet d’Eau and try out some more Swiss chocolate. 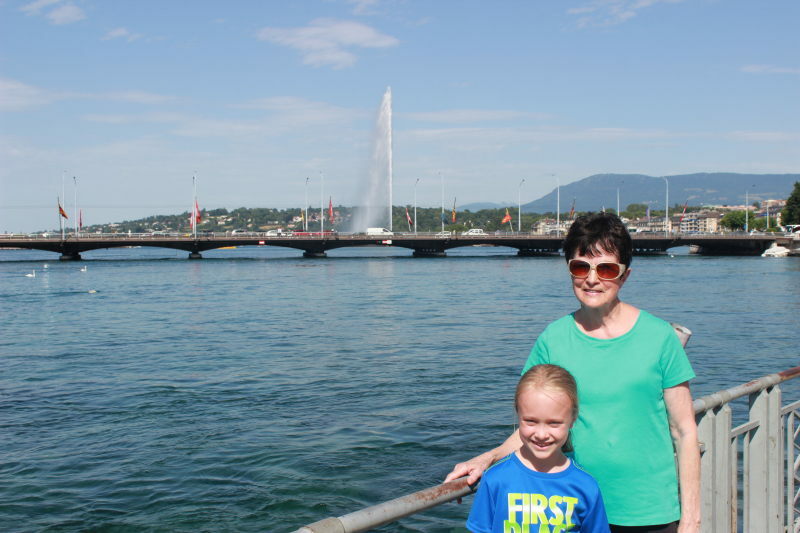 Toren and Rosemary at the Jet d’Eau in Geneva. 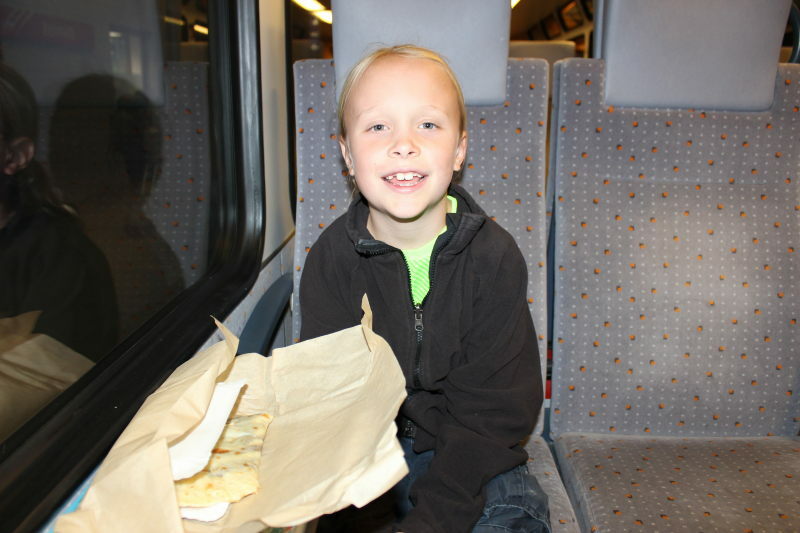 We then caught a train back to Lausanne to pack up for our flight home the next day. Our trip to Iceland occurred because I was presenting some research at a conference in Lausanne, Switzerland. We spent a week in Iceland before heading to Switzerland. 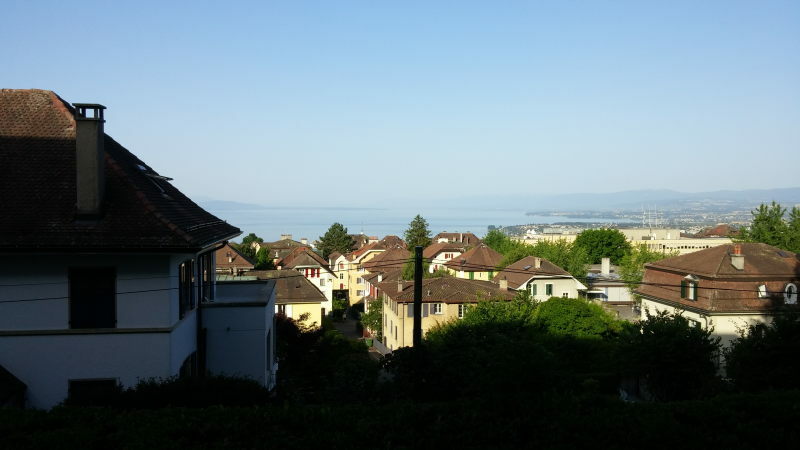 We flew into Geneva then took a train to Lausanne, where we stayed in a nice apartment (AirBnB) with an amazing view of Lake Geneva. The view from our AirBnB in Lausanne. I really only got to spend two days doing touristy stuff in Switzerland – the day before the conference and the last day of the conference (which I skipped to go to CERN, ’cause it’s CERN). 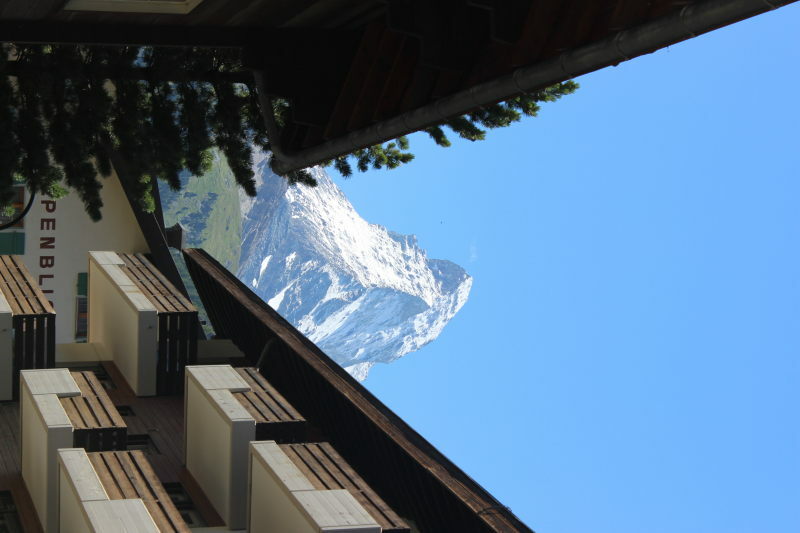 The day before the conference, we decided to head into the Swiss Alps to see the Matterhorn. 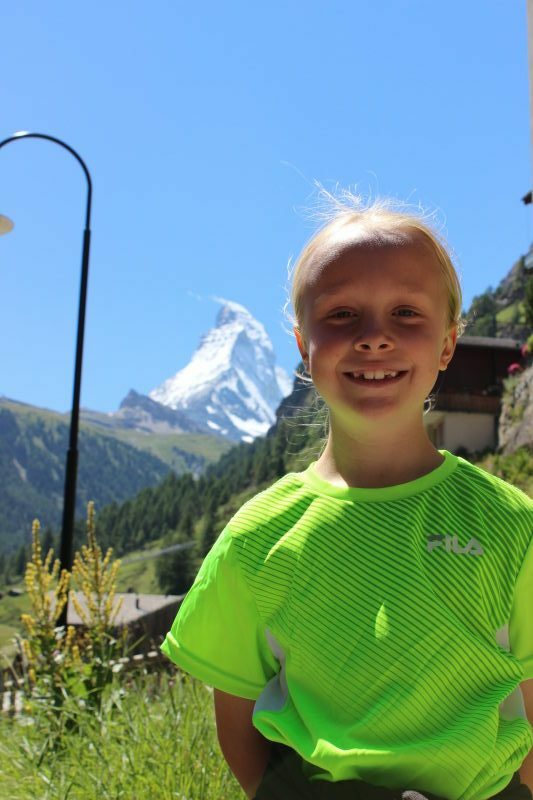 Toren with the Matterhorn as backdrop in Zermatt. 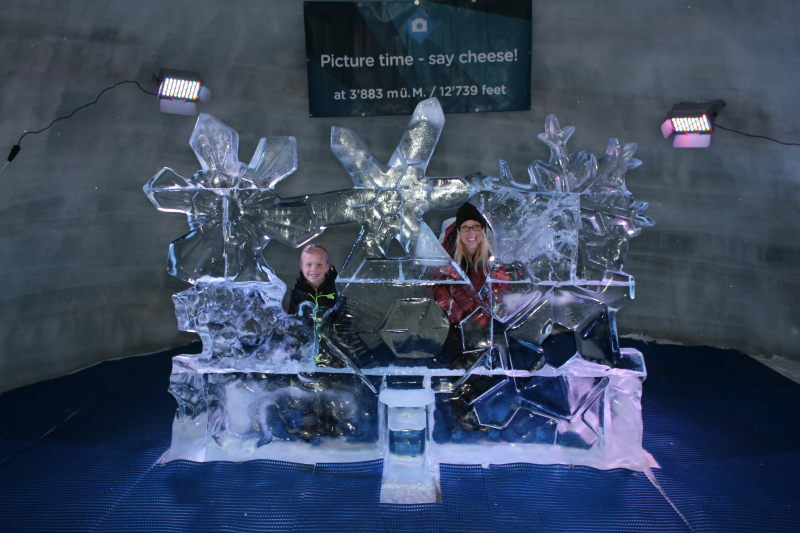 Toren and Debi by an ice sculpture inside the glacier. 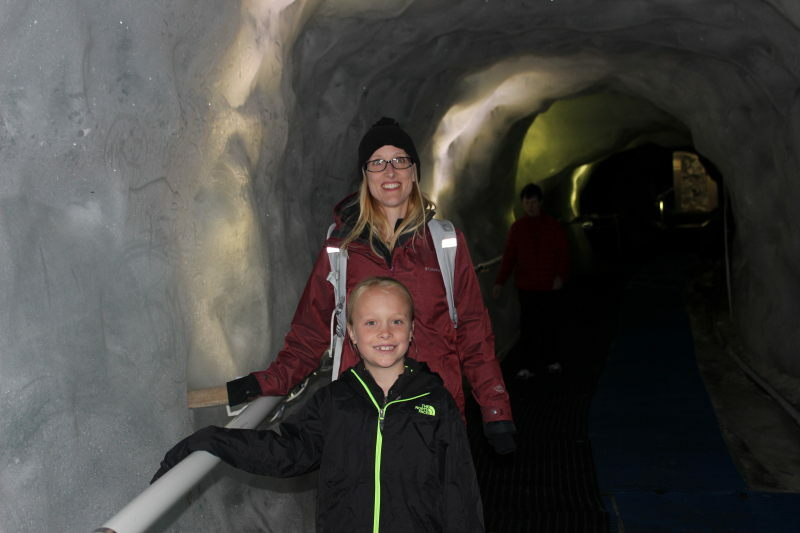 Debi and Toren (with Rosemary in the background) inside the glacier. 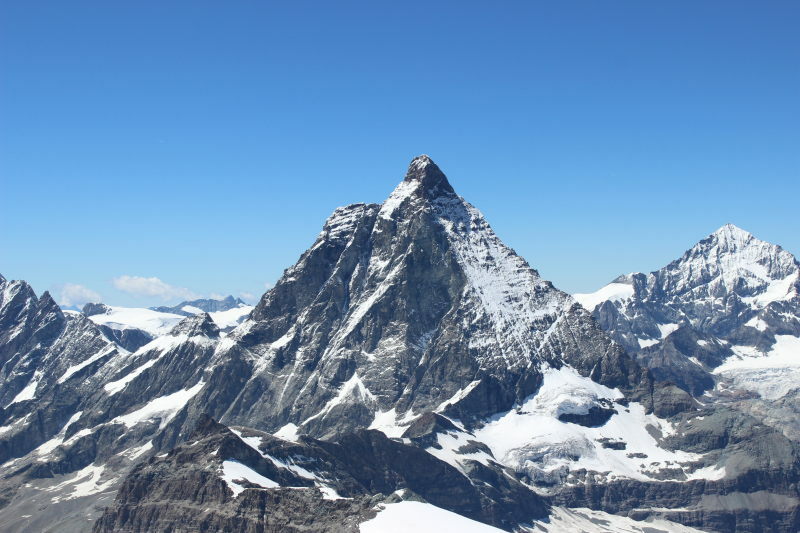 The Matterhorn from Matterhorn Glacier Paradise viewing platform. 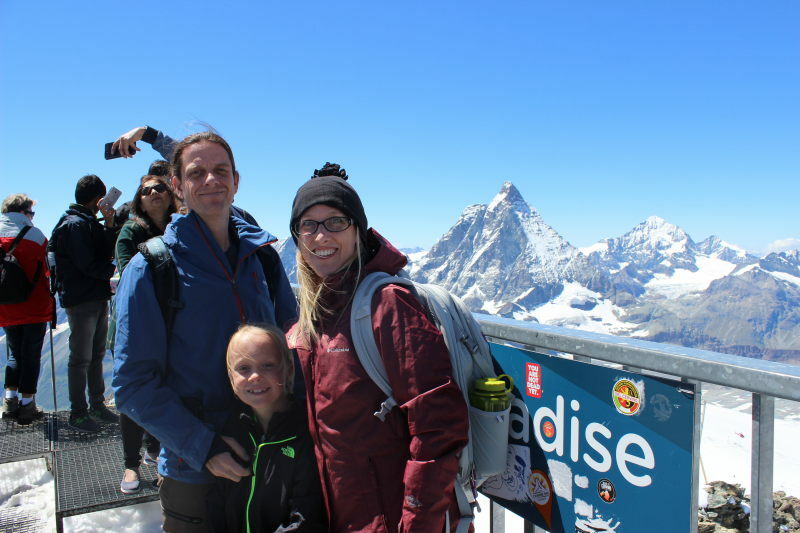 The three of us on the viewing platform on top of Matterhorn Glacier Paradise (Italy in the background). 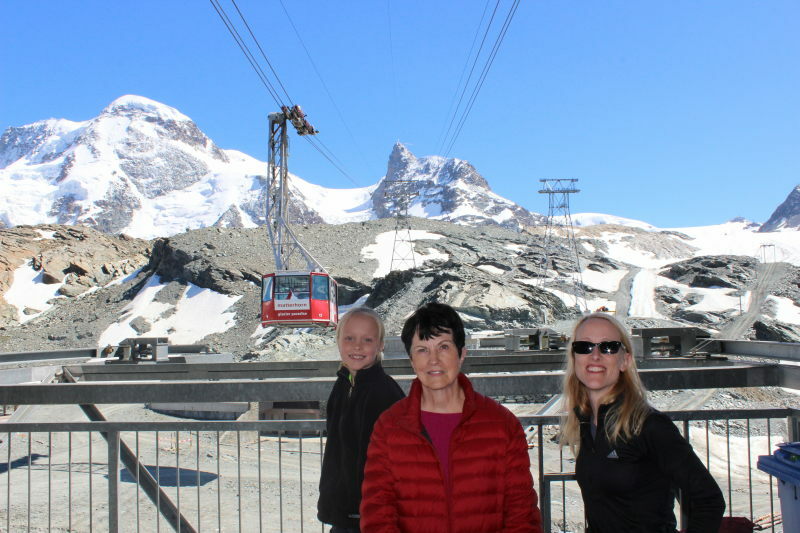 Rosemary, Toren, and Debi on the glacier with the Matterhorn in the background. On the way back down, we stopped to take a few more photos along the way. 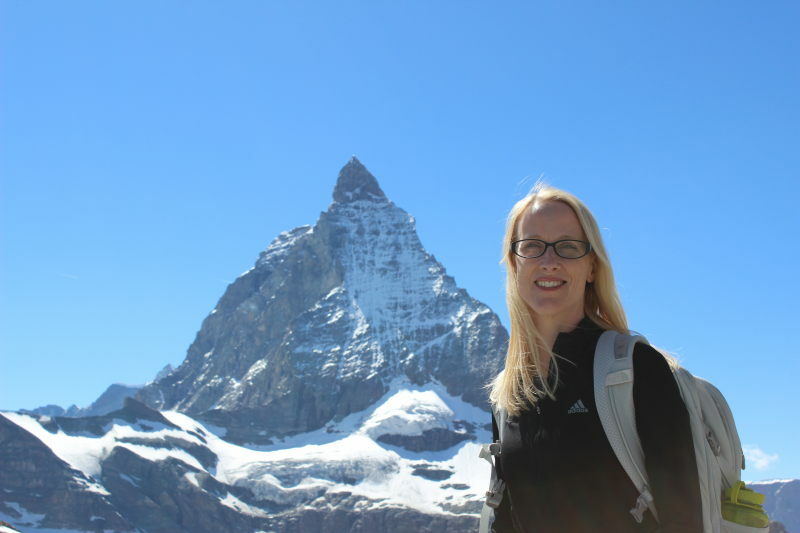 Debi in front of the Matterhorn. 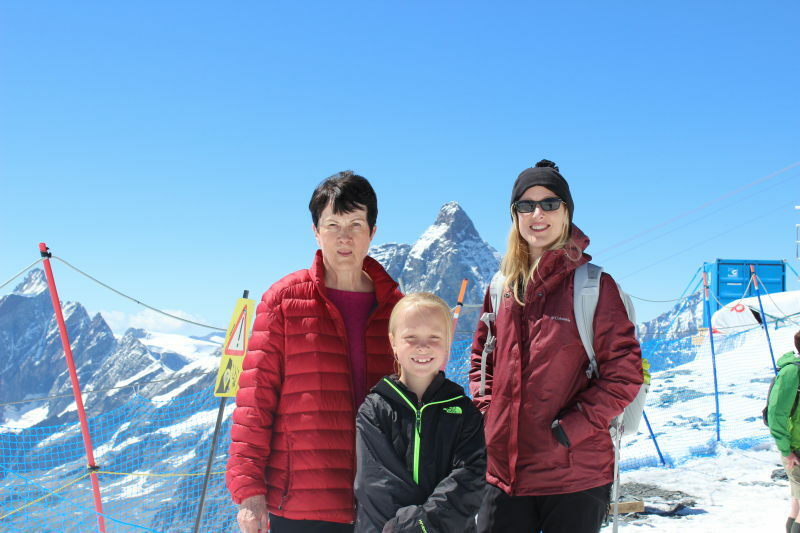 Toren, Rosemary, and Debi in front of the Matterhorn Glacier Paradise. 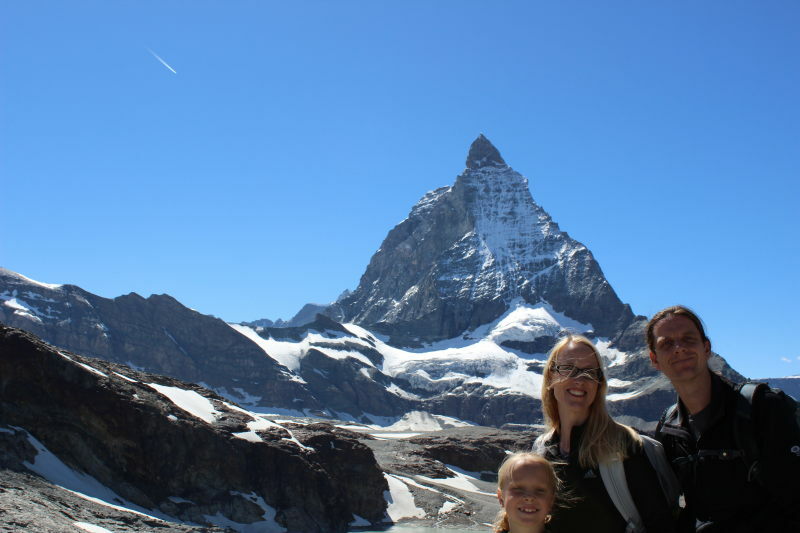 The three of us in front of the Matterhorn. We got a later start than we hoped and ended up not having a lot of time on the mountain, otherwise, we would have done some hiking. Even so, it was a great initial exposure to the Swiss Alps. 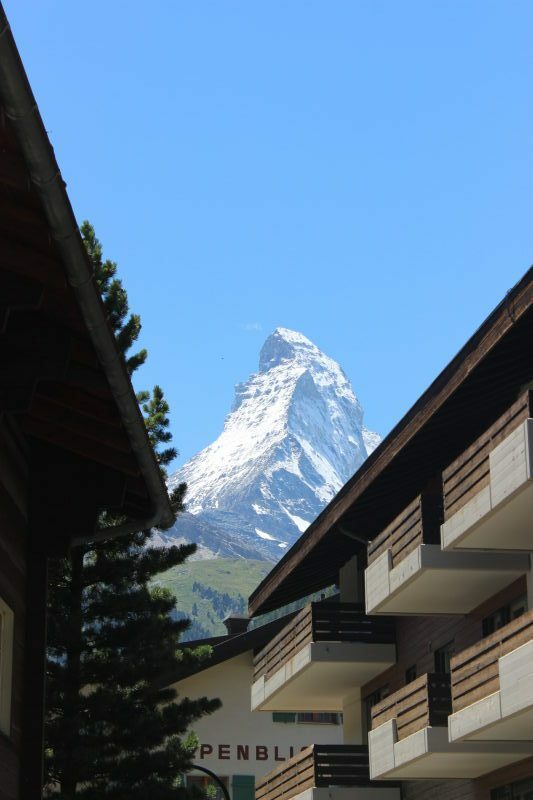 After we took the lift back to Zermatt, we walked through the town looking for a place for dinner. Along the way, we were treated to this fun encounter with a bunch of goats. We eventually found a fondue place. Toren, Rosemary, and I had cheese fondue (dipped bread and potatoes), while Debi went off in search of a chicken sandwich. 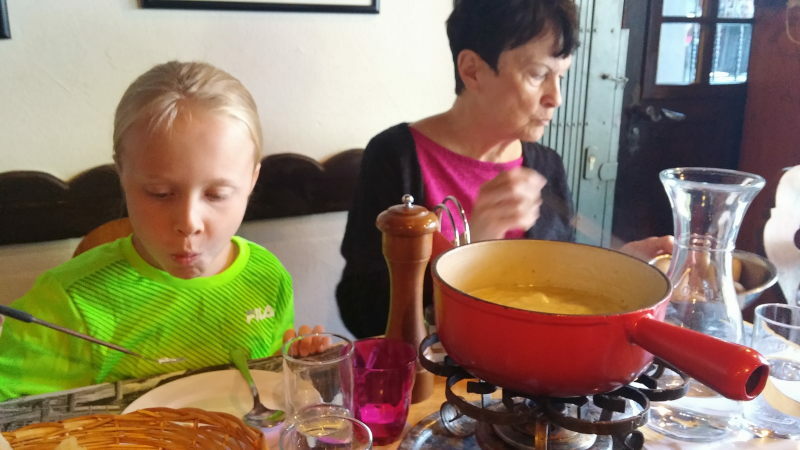 Toren and Rosemary enjoying Swiss fondue in Zermatt. The train ride itself was quite scenic and took us through the southwestern portion of Switzerland. We ended up getting home quite late, but it was well worth the trip. 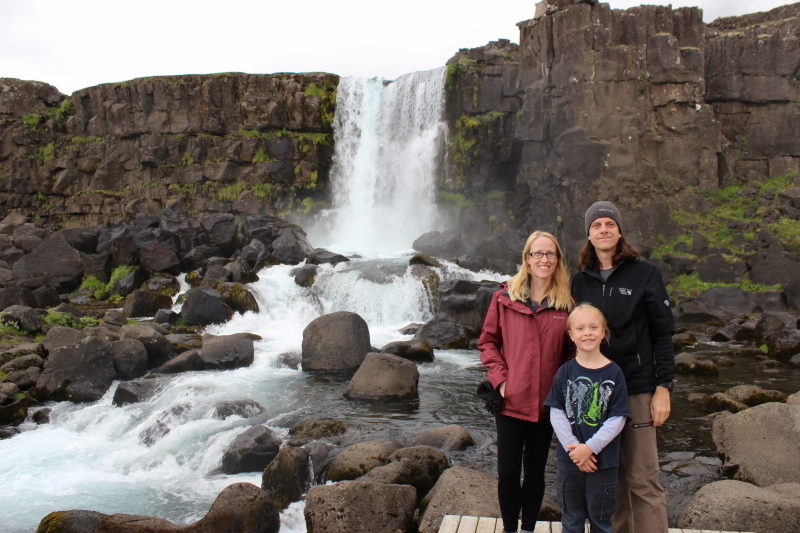 We saved some of the most visited sites for our last day in Iceland. 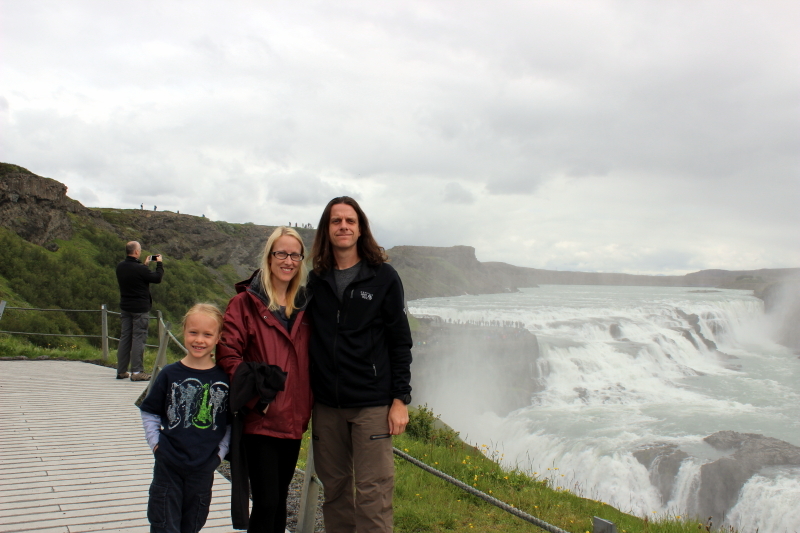 Lots of buses take tourists to visit three sights in a single day: Gullfoss, Geysir, and Þingvellir National Park. This is often referred to as The Golden Circle as you can include Seljalandfoss and actually make it into a circle. 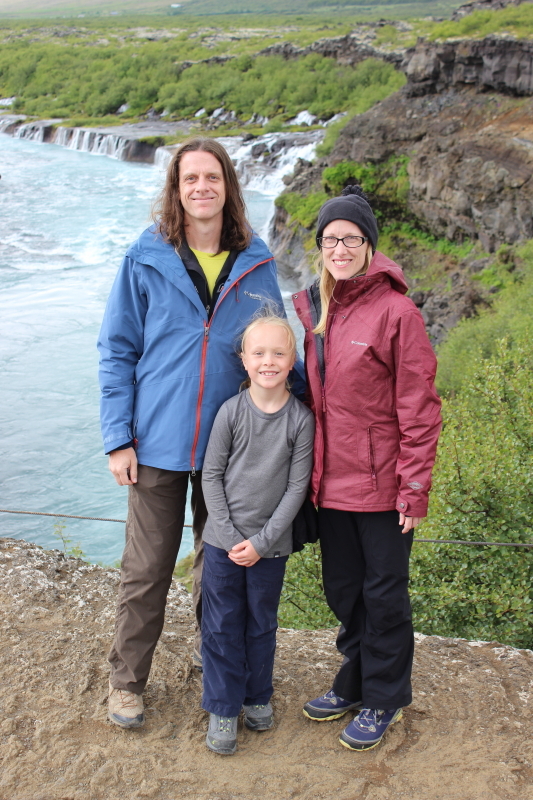 Since we had already visited Seljalandfoss, we headed straight to Gullfoss. Gullfoss is a very powerful waterfall with two levels. To get a good view of how tall the lower falls are, you need to hike up a bit so you can see down into the trench it has carved. Just down the road from Gulfoss are two geysers, Geysir and Strokkur. Geysir was the first geyser to be documented by modern Europeans and is the source of the English word “geyser.” Geysir no longer regularly erupts, but Strokkur does every few minutes. We spent a couple of hours here walking around the lake, streams, the church, and the canyon. Everyone but Debi was able to get their piece of frozen, fermented shark down. Debi gagged on hers. 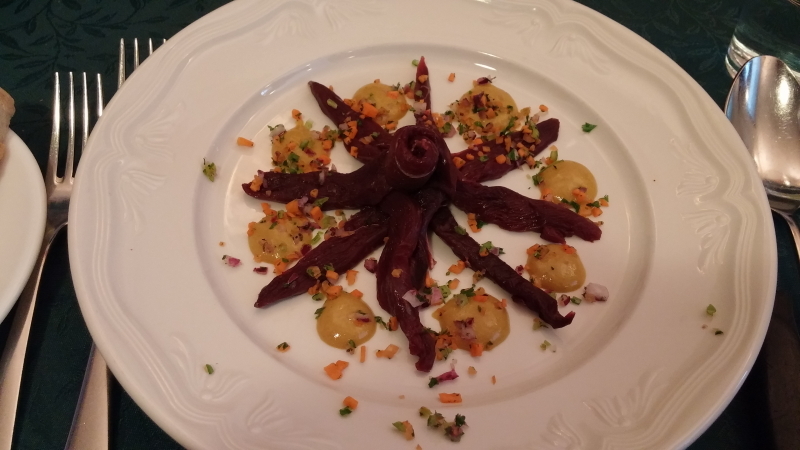 Imagine the most fishy tasting fish you’ve ever had, then leave it to spoil for, let’s say, a week. Then freeze it. That’s what fermented shark tastes like. Not a winner. We asked on our whale and puffin viewing trip if puffins were endangered and they said no, so I didn’t feel bad ordering this. It’s basically thin strips of puffin breast, perhaps lightly cooked, served with a mustard sauce. It tasted kind of like chicken, but more oily and stringy. Everyone tried it, but I ended up eating most of it. 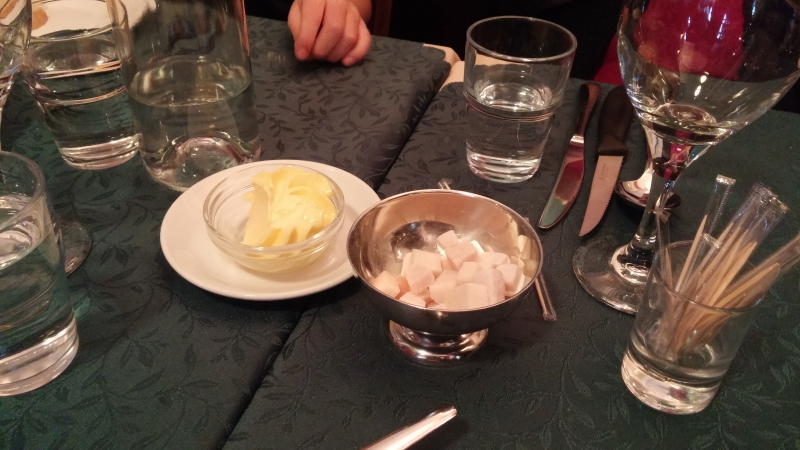 We also ordered fish stew as an appetizer, which wasn’t particularly exotic, and most everyone liked it. For the entrees, it was a lamb steak (split between Debi and Rosemary) and a horse steak (split between Toren and me). The steaks were all good; horse tastes a lot like cow. Dinner was crazy-expensive, but we got to sample the local cuisine. Our goal on day 6 was to make it from Akureyri back to Reykjavik, while doing a little sightseeing along the way. 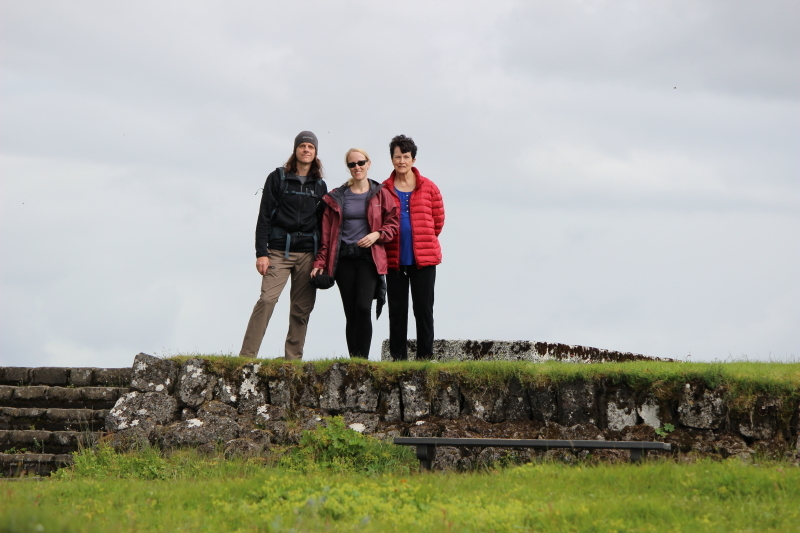 I found three things that looked cool in Western Iceland (that we could do on the way), but we only managed to visit two of them. One location I wanted to visit, Grábrók, we couldn’t find. Google maps sent us off on a really sketchy, dirt road that we should never have taken. It was a single lane road with big pot holes, cliff edges, rocks, and all the fun stuff that would be great in a large SUV, but not so much in a small, close to the road, wagon. With that side adventure out of the way, our first stop was Deildartunguhver, which is another spot with volcanic activity. This location was pretty cool as it had lots of boiling water and sulphur vents, but was also a location where the country had tapped into the geothermal energy and was using it to heat water. After Deildartunguhver, we headed to Hraunfossar and Barnafossar, which is another set of two waterfalls. The first set of waterfalls, Hraunfossar, kind of drizzle out of the side of a cliff, which you can see in the background of this photo. From Hraunfossar and Barnafossar, we opted to take the new Hvalfjörður Tunnel, which drops under a channel by going under the seabed (541 feet below sea level). This cuts about 45 minutes off the time to get to Reykjavik and costs about $10.00. It’s deep enough that your ears pop as you drive underneath the sea. Pretty cool to say we have now driven under the ocean! We had two nights scheduled in a bed and breakfast in Seltjarnarnes, which is the tail end of the peninsula where Reykjavik lies. That wrapped up day 6.